For over 40,000 years shamanic societies throughout the world have used various musical strategies to achieve altered states of consciousness. These states, which are believed to be essential components to most of their sacred rituals and ceremonies, offer infinite varieties of inner landscapes which the shaman must navigate in order to retrieve insight and wisdom, and bring healing to the community. Drums and percussion, played in a continuous, driving manner are the basic instruments used for these purposes. 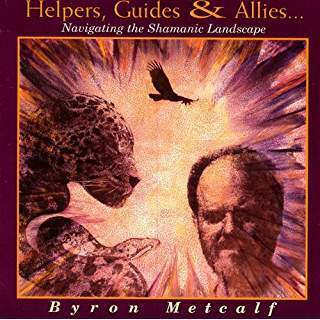 With this in mind, Helpers, Guides & Allies…was inspired by Byron’s passionate interest and involvement in the healing potential of non-ordinary (altered states) of consciousness.